5 Marlborough is located on the north side of Marlborough, between Arlington and Berkeley, with 3 Marlborough to the east and 7 Marlborough to the west. 5 Marlborough was designed by architect Charles K. Kirby and built by William W. Bray, mason, in 1862-1863, one of three contiguous houses (3-5-7 Marlborough) that form a symmetrical composition with a single entrance porch. On March 9, 1863, as the houses were nearing completion, Charles Kirby purchased the land from Messrs. Chandler, Davis, and Lee. On the same day, he sold 5 Marlborough to Henry Winthrop Sargent. He also sold 3 Marlborough on the same day, and sold 7 Marlborough in May of 1863. Each of the deeds included a provision preventing material changes to the front façades without the consent of the owners of all three properties. Click here for an index to the deeds for 5 Marlborough. Henry Winthrop Sargent and his wife, Caroline (Olmstead) Sargent, made 5 Marlborough their Boston home. Their primary residence was at their estate, Wodenethe, overlooking the Hudson in Fishkill Landing (now Beacon) New York. A former banker, in 1841 Henry Sargent had retired to Wodenethe to become a horticulturalist and landscape gardener. The Sargents’ son, Winthrop Henry Sargent, an attorney, lived with them. He married in December of 1873 to Aimée Rotch. They lived with his parents at 5 Marlborough until about 1877, when they moved to 174 Marlborough. Henry Sargent died in November of 1885. 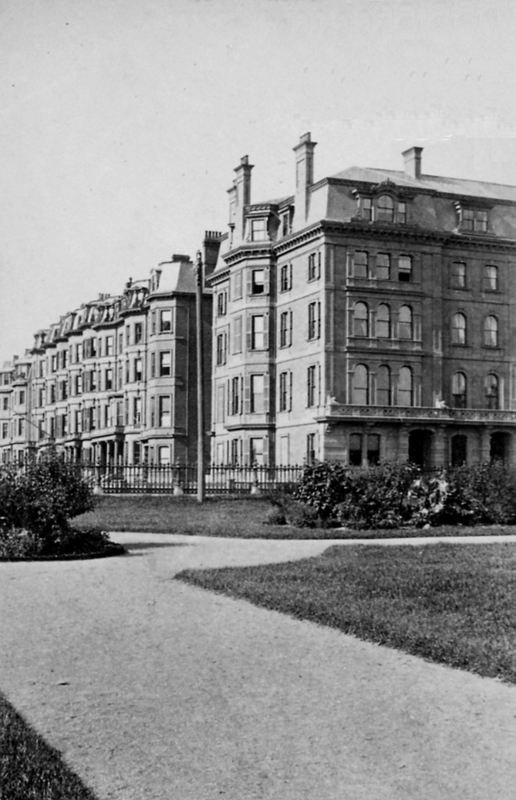 5 Marlborough continued to be Caroline Sargent’s Boston residence until her death in February of 1887. 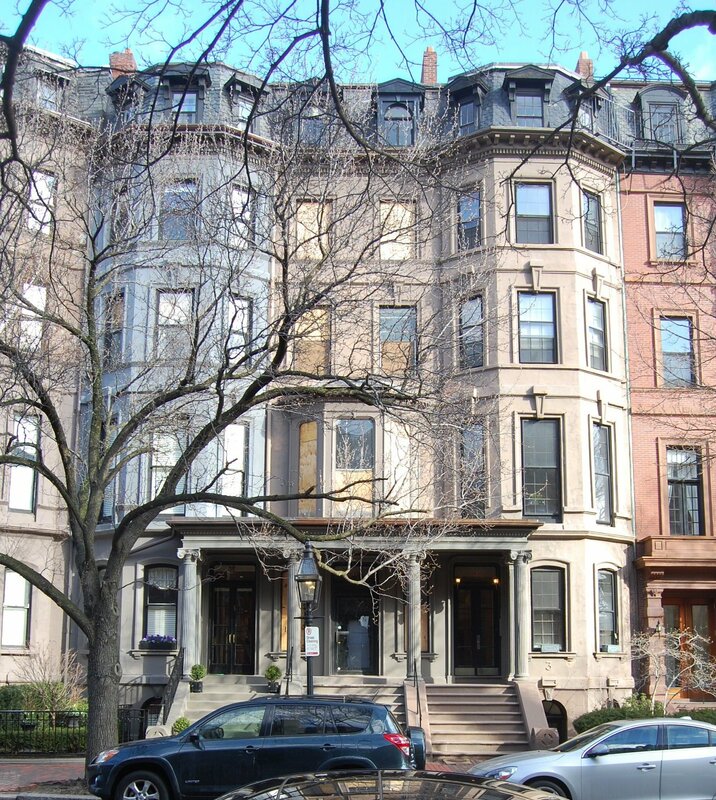 5 Marlborough was inherited by Winthrop Sargent and, after his death in September of 1916, by his widow, Aimée (Rotch) Sargent. They leased the house to others. By the 1887-1888 winter season, 5 Marlborough was the home of woolen merchant and manufacturer George Keith Guild and his wife, Marion (Pelton) Guild. They had been married in November of 1887, and 5 Marlborough probably was their first home together. They also maintained a home in West Roxbury. They continued to live at 5 Marlborough in 1891, but had made West Roxbury their primary residence by 1892. During the 1891-1892 winter season, 5 Marlborough was the home of John Healey Childe and his wife, Jessie Duncan (Clark) Childe. They moved by the 1892-1893 season, and by the 1894-1895 season were living at 103 Beacon. 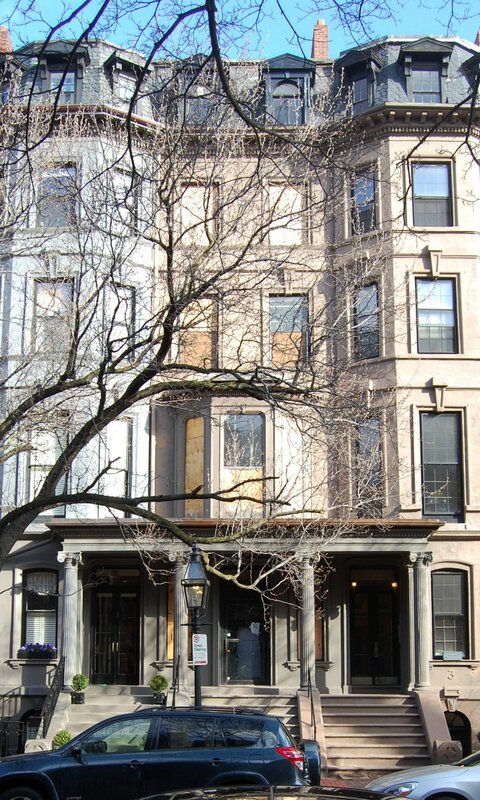 5 Marlborough was not listed in the 1893 and 1894 Blue Books. By 1895, 5 Marlborough was a private school operated by Miss Elizabeth Josephine Woodward and Miss Bertha Hazard. 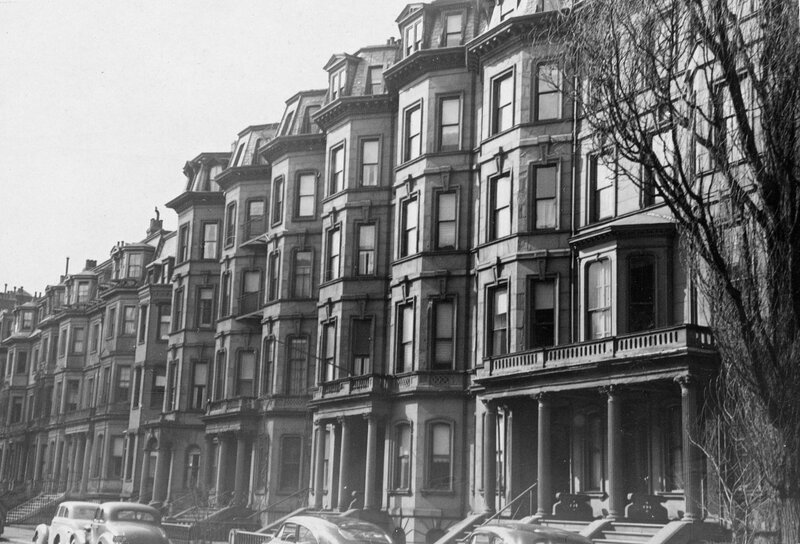 Miss Woodward lived at 29 Copeland in Roxbury and Miss Hazard lived at 18 Centre. The school was co-educational and appears to have continued the progressive teaching approach pioneered by the school founded by Pauline (Agassiz) Shaw across the street, at 6 Marlborough, which closed in about 1894; in fact, Miss Woodward’s and Miss Hazard’s school may have operated as “Shaw School” for several years. Miss Woodward and Miss Hazard continued to operate a school at 5 Marlborough until about 1898, when they moved it to 319 Marlborough. By 1898, 5 Marlborough was the home of Miss Elizabeth C. Bridge, a teacher, who continued to operate it as a school. She had lived (and taught) at 16 Chestnut in 1897. She continued to live and operate her school at 5 Marlborough until about 1901. 5 Marlborough was not listed in the 1902 Blue Book. By the 1902-1903 winter season, it was the home of Dr. Hugh Cabot and his wife, Mary Anderson (Boit) Cabot. Hugh Cabot was a surgeon and urologist, in practice with his cousin, Dr. Arthur Tracy Cabot, who lived at 3 Marlborough. They maintained their practice at 1 Marlborough (owned by Arthur Cabot), which also was a lodging house where Hugh Cabot lived before his marriage to Mary Boit in September of 1902. 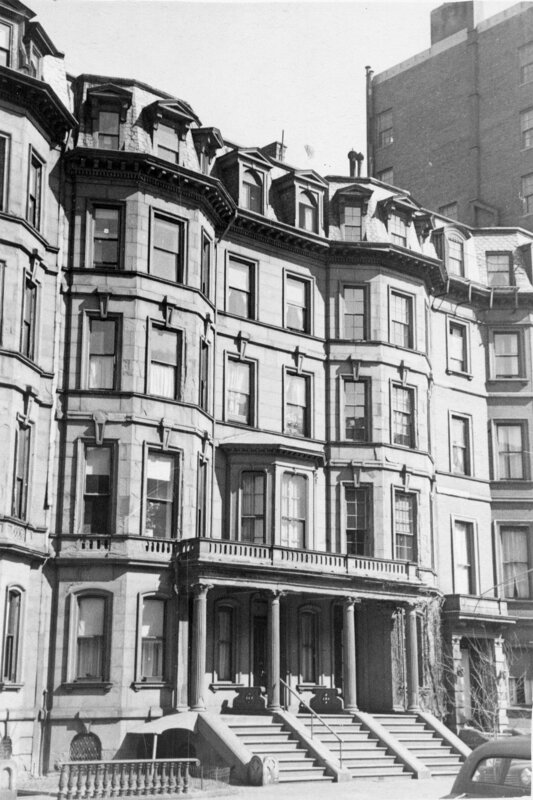 Hugh and Mary Cabot continued to live at 5 Marlborough in 1907, but had moved to 87 Marlborough by 1908. 5 Marlborough was not listed in the 1908 Blue Book. By the 1908-1909 winter season, 5 Marlborough was the home of Mrs. Agnes (Olney) Minot, widow of dry goods merchant George Richards Minot, Jr. She previously had lived at 415 Commonwealth. She continued to live at 5 Marlborough until about 1914. In June of 1914, Winthrop Sargent received approval from the Board of Appeal to replace the existing wooden ell and shed at the rear of the building with a new, terra cotta ell. By the 1914-1915 winter season, 5 Marlborough was the home of cotton broker Rudolph Weld and his wife, Sylvia Caroline (Parsons) Weld. In 1913, they had lived at 113 Marlborough. 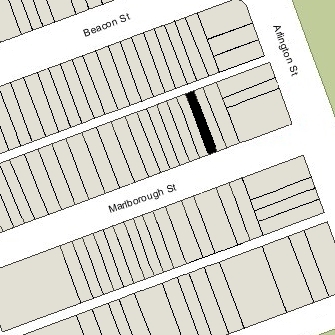 They continued to live at 5 Marlborough in 1917, but moved to 63 Marlborough by 1918. 5 Marlborough was not listed in the 1918-1919 Blue Books. Aimée (Rotch) Sargent died in April of 1918, and on December 30, 1919, 5 Marlborough was acquired from her estate by Dr. Arthur William Doubleday, a dentist. He and his wife, Florence Louise (Fuller) Doubleday, lived in an apartment at 220 Marlborough, where he also maintained his dental office. During the 1919-1920 and 1920-1921 winter seasons, 5 Marlborough was the home of Mrs. Elizabeth (Brooks) Wheelwright, the widow of architect Edmund March Wheelwright. Their daughter, Louise, and son, John Brooks Wheelwright (a poet and founding member of the Trotskyist Socialist Workers Party) lived with her. She also maintained a home in Dedham. By 1922, they had moved to 80 Marlborough. By the 1921-1922 season, Arthur and Florence Doubleday had made 5 Marlborough their home, and he had also moved his dental office there. They continued to live at 5 Marlborough in 1924, but moved thereafter. By 1930, they were living in Woodstock, Vermont. On August 27, 1924, 5 Marlborough was acquired from Arthur Doubleday by Miss Dorothy Sarah Frances May Codman. She made it her Boston home, joined by her unmarried brothers, Hugh Codman and Thomas Newbold Codman. Their primary residence was their family home, The Grange, in Lincoln. Their older brother was Ogden Codman, Jr., the noted architect and interior designer. Hugh Codman died in September of 1946, and Thomas Codman moved to Europe to live with his brother, Ogden, in 1949. Dorothy Codman continued to live at 5 Marlborough until about 1951, after which she made The Grange her year-round home. On August 31, 1953, 5 Marlborough was acquired from Dorothy Codman by Constance (Concetta) A. (Sansone) Mayo, the wife of Joseph Mayo. They lived in Belmont. In December of 1953. he applied for (and subsequently received) permission to convert the house from a single-family dwelling into six apartments. On February 5, 1968, 5 Marlborough was acquired from Constance Mayo by real estate broker and investor Charles M. Talanian. On January 16, 1980, he transferred it to a limited partnership, Chatal Associates LLC. 5 Marlborough subsequently changed hands, remaining a six unit apartment building. On May 20, 2013, 5 Marlborough was purchased by the 5 Marlborough LLC (Ty Gupta, manager of record). On March 25, 2014, it transferred the property to the BBLV LLC (Ty Gupta and Anthony O’Byrne, managers of record). In June of 2016, BBLV LLC received permission to remodel 5 Marlborough and convert it from six apartments into a single-family dwelling with an interior garage.